Providing expertise and resources to help overcome trauma and its effects and encourage environments designed for safe, healthy, and engaged learning. The enduring impacts of childhood trauma are widespread. Many educators and other child- and youth-serving professionals see the effects of trauma in their environments every day. Knowledge, skills, and services are required to help boost resilience, promote well-being, and mitigate the impacts of trauma for children nationwide. 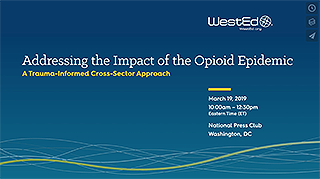 WestEd is addressing the challenge of the opioid epidemic and its widespread impact through cross-sector collaboration and the development of trauma-informed systems that support teaching and learning. Subscribe to our semi-monthly E-Bulletin for the latest research, free resources, and solutions from WestEd. WestEd delivers solutions to help integrate trauma-informed practices with other whole-child initiatives, such as social and emotional learning approaches, restorative practice approaches, and school climate and culture efforts. We are guided in this work by the WestEd mission, vision, and values. We also strengthen our work with you in accordance with the following principles. We will seek to strengthen children, families, and communities, especially those who have been underserved. We will be data-driven in our work, think creatively and expansively, try new approaches, and share important evidence-based findings. We will collaborate across sectors and disciplines. We will work to surmount the barriers and obstacles between us. We will value the individuals, families, and communities we serve and the expertise they bring to this work. To promote equity and build capacity, we will support individuals, organizations, and communities in leading and sustaining their own work. WestEd brings deep experience and understanding to provide support for children, youth, and families, especially those who have experienced poverty, homelessness, foster care, immigration, physical or sexual assault, learning or developmental challenges, and racial or gender discrimination. WestEd is also actively addressing the impacts of the opioid epidemic by promoting the development of trauma-informed systems that support teaching and learning. Our service focus, designed around your needs, includes the following solutions. WestEd delivers in-person, virtual, and hybrid training and coaching. Our work supports a range of customizable formats, including support for Train-the-Trainer (TTT) and/or coaching models, Communities of Practice/Professional Learning Communities, and support for creation of credit-bearing courses. Our work includes support for workgroup/steering committee facilitation, strategic planning, meeting facilitation, and systems design including cross-sector convening and collective action facilitation. WestEd partners with child- and youth-serving organizations to design experimental and quasi-experimental studies and program and economic evaluations. Our expertise includes identifying creative financing strategies, conducting policy reviews, and other related activities. This [TIP-ECE] training exceeded our expectations and we look forward to bringing additional trainings to our community. [Our training] has provided staff with the tools necessary to work with the populations we serve on a daily basis, and at the same time trained staff on how to recognize their own triggers and take care of themselves in the process. Our team is comprised of leaders from education, health, mental health, and other professions who are highly skilled bringing evidence-based and promising approaches to clients working directly with trauma-impacted children. Subscribe Now to our semi-monthly E-Bulletin for the latest research, free resources, and solutions from WestEd.